Whether in an ancient alpine hut on the pasture, in a traditional wood-paneled room of an inn or in a gourmet restaurant, the South Tyrolean cuisine is characterized by fresh harvested ingredients, hearty meals, Mediterranean sophistication and especially by loving and savory preparation. Let yourself be pampered by the South Tyrolean cuisine and enjoy the unique culinary delights like bacon dumplings, ravioli, Tirtlan, donut or apple strudel! Visit the numerous events of the country and experience the South Tyrolean traditions in an unique atmosphere. 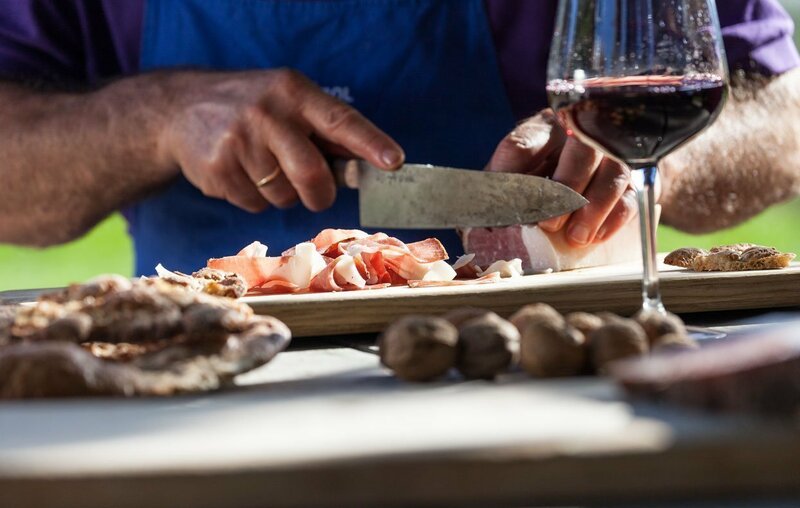 Taste fine wines at the various wine festivals, wine walks or in the cellars and enjoy South Tyrolean delicacies during speck or strudel festivals. Autumn is the time of gastronomic entertainment! The fingers of black sooty chestnut, juicy crisp apples and grapes, warming soups and sweet donuts – this is the Törggelen time in South Tyrol. Traditional inns and taverns invite you after a walk to stop and enjoy the get-together and taste young wine, sweet wine, chestnuts, speck, cabbage and more. In addition there is the one or the other funny sung ditty and a lot of South Tyrolean joyful way of life – an unforgettable experience.